This past week began a special series for the Bovine Ska and Rocksteady. After 4/29/2015, the Bovine Ska and Rocksteady will no longer be on WMBR because we are moving out of Boston. To commemorate the last three shows of the Bovine Ska and Rocksteady in Cambridge/Boston, we began a three episode spotlight on an artist dearest to our hearts, Keith “Slim” Smith. The mission of the Bovine Ska and Rocksteady has always been to share and uncover rare Jamaican music. Consequently, these last shows will feature short record label spotlights for small labels in addition to the three part spotlight on a star who should be in the global company of Bob Marley and Jimmy Cliff but is not well known outside of Jamaica. For the 4/15/2015 edition, we started the show with two sets of early reggae, featuring “Dengue Fever” from The Scorchers and the ever-too-pretty “If I Had the Right” from Alton Ellis. After the opening reggae sets, we presented mento from Jamaica’s hotel bands, specifically The Hiltonaires, the house band of Kingston’s Hilton Hotel, The Wrigglers, one of the bands for the Arawak Hotel, and Monty Reynolds and His Silver Seas Orchestra, the house band for the Silver Seas Hotel. Then, to close the first hour, we presented a short label spotlight on a record label that we’ve wanted to review for sometime but had great difficulty in finding the tracks: the Moo’s label. We know that the man behind the Moo’s label was Charlie Moo, but beyond that, we don’t know much about the origins or the end of the label. 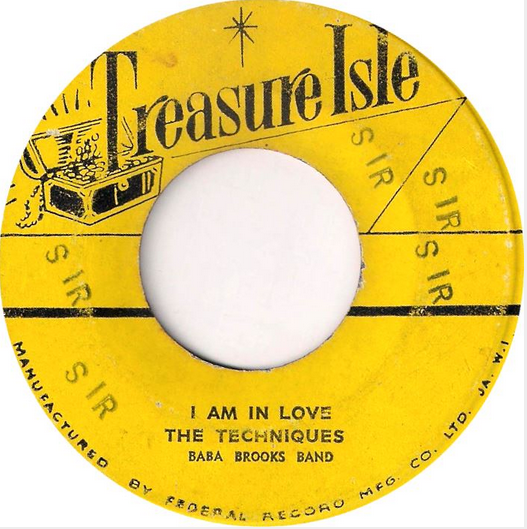 The spotlight featured Jamaican Rhythm and Blues tracks from each of the artists from the small catalog of Moo’s label releases: Lloyd Clarke, Basil Gabbidon, Rico Rodriguez, Johnny Moore, Owen Gray and Clancy Eccles. The second hour was dedicated entirely to the first part of the Slim Smith tribute trilogy: his time with The Techniques. Slim Smith began his music career as a teenager attending Kingston Senior School. He along with classmates Frederick Waite, Franklyn White, the Richards Brothers, and Winston Riley entered Edward Seaga’s Chocomo Lawn youth club in Wellington Street in 1962 to emerge as the house band for the club with all members singing and playing instruments. After spending time backing up solo singers who visited the club and in concerts, Seaga arranged for The Techniques vocal group, now consisting of just Slim Smith on lead vocals, Winston Riley, Frederick Waite, and Franklyn White, to record on their own at Federal records with the track, “No One,” which was produced by Byron Lee and released on Kentone in 1963 to some attention but not too much. We heard this first track and another early Kentone track from the Techniques to kick off this spotlight on Slim Smith. Everything began to change in 1964 for the Techniques. “No One” would be internationally distributed by Columbia in England in 1964 and by the Curtis Mayfield compiled This Real Jamaica Ska, which was released on Epic in America. Then, as the Victor Youths Band, Slim, Winston, Frederick, and Franklin were winners in the ska and mento contest in the 1964 Jamaica Festival. And, in that same year the Techniques were introduced to Duke Reid by Ken Boothe and Stranger Cole, and they would record, “Little Did You Know” with him, which would become the first major hit for the group. To kick off the spotlight, we presented The Techniques’ finest work with Duke Reid. After their time with Duke Reid and his Treasure Isle, The Techniques then recorded with Sonia Pottinger at her Gayfeet label, which we presented next. Often Generoso calls The Techniques the greatest vocal band in Jamaica, and this is because beyond Slim Smith, many of the members who rotated in then out of the group were stars in their own right. After Slim Smith left, the mighty Pat Kelly was brought in to take over lead vocals. Shortly after the arrival of Pat, Bruce Ruffin also joined the group, and this version of the Techniques was responsible for some of the best adaptations of tracks from Curtis Mayfield and The Impressions. In addition to these two talents, the Techniques would also have the voices of Junior Menz, Lloyd Parks, and Dave Barker during the group’s various re-incarnations. Listen to The Techniques spotlight and the full show HERE. The archive will be available until 4/28/2015. Enjoy! And don’t worry, the Bovine Ska will return in another radio form. We’ll be sure to update here! For this past week’s show, we began with two sets of mid-tempo ska, beginning with a spectacular one from Henry Buckley himself on his own Merritone label entitled, “Reap What You Sew.” Afterwards, in the second set of ska, we presented the amazing “Run Rudies Run” from Lee Perry and the Gaylads. To start the second half of the show, we featured a memorial spotlight on Horace Faith, who passed away on March 8, 2015. Unfortunately, we don’t know too much about Horace’s bio. We do know he was born as Horace Smith in Jamaica, but given his extensive recording for English labels and a small tidbit shared with us on an annotated episode of Top of the Pops, we know that he immigrated to England as a young man and spent a good chunk of his music career there. “Black Pearl” is a cover of the song with the same title by Sonny & The Checkmates, and with this cover, Horace Faith gained quite a bit of popularity. It reached #13 on the U.S. Billboard top 100 and #13 on the UK singles chart as well. The spotlight included both reggae and soul cuts from Horace Faith, all of which had beautiful and lavish compositions. Listen to the spotlight and the full program HERE. Enjoy! The archive will be available until 4/21/2015. For the 1001 episode of the Bovine Ska and Rocksteady, we kicked off the show with an amazing version-to-version-to-version-to-version excursion with the Satta Massa Ganna rhythm, beginning with the original recording of “Satta Massa Ganna” by The Abyssianians. After that trip down version road, we presented some more reggae, including the chilling and stunning “Devil in Bed” from Cornell Campbell. Consequently, in the spotlight, you will only hear the songs he recorded before he took his two year hiatus from recording and before he returned to the music industry in 1967 when he would record again and produce other artists. Born in Saint Mary parish in 1940 to a tailor and builder, Clancy Eccles began his love for music in the church. Particularly inspired by his uncle who was a spiritual revivalist, Eccles began singing at church as a boy. As a teenager, he moved to secular music, singing to tourists in the hotel circuit on the Northern Coast of Jamaica. Then, as a young man, he moved to Ocho Rios and performed in nighttime shows where he shared stages with the Blues Busters, Higgs & Wilson, and Buster Brown. 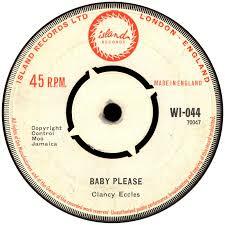 After working the live performance circuit for a few years, Clancy decided to move to Kingston in 1959 where the recording industry was beginning to rise, and eventually, he began working with Coxone Dodd. He first recorded Freedom for Coxone, which was a single played on his sound system before it was pressed for distribution. As a political song discussing repatriation to Africa, Freedom was actually one of the earliest songs to be used in a political campaign; Alexander Bustamente used it in his battle against the Federation of the West Indies in 1960. You’ll hear Freedom to kick off the spotlight on Clancy Eccles’ early recordings. By 1962, Clancy began running his own talent shows and producing live shows for artists such as The Clarendonians and The Wailers. The next year, Clancy began working with other producers including Charlie Moo and Lyndon Pottinger. You’ll hear his work from these producers in the second part of the spotlight. Happy April! Hope you enjoy the show! The archive link will be available until 4/14/2015.